A daguerreotype from the Jules Martino collection pictures U.S. navy Lt. Thompson Darrah Shaw in about 1848. His story is told on page 45. A member of the Putnam Phalanx, a militia group organized in 1858 at Hartford, Conn., to honor the memory of Revolutionary War notable Samuel Putnam, stands in his Continental army-inspired uniform. The image, a carte de visite, is part of the Michael J. McAfee collection. The editor pays tribute to former editors, past and present contributors, and subscribers on occasion of the magazine’s 30th anniversary. Since MI made its debut in 1979, an estimated 10,000-15,000 photographs have been published of soldiers spanning from the Mexican War through World War I. Also included is a dedication to the editor’s mother, Evelyn K. Neville (1934-2008). Two volumes receive positive reviews. Organization and Insignia of the American Expeditionary Force 1917-1923 by Robert J. Dalessandro and Michael G. Knapp (Schiffer Publishing Ltd.) received high marks for its history and imagery. Our Honored Dead, Allegheny County, Pennsylvania in the American Civil War by Arthur B. Fox is noted for learning about the soldiers and regiments from this region of the country. A total of 17 hard plate images include four antebellum portraits and 13 Civil War soldiers. Confederates dominate the latter group with 11 photographs. Two are identified: Pvt. Felden Tyler of Pierce’s Battalion of Virginia Heavy Artillery and Pvt. Lewis Hicks of the 53rd North Carolina Infantry. A dozen images of Union soldiers posed in groups of two or more compose this gallery by Coddington, the author of Faces of the Civil War: An Album of Union Soldiers and Their Stories (Johns Hopkins University Press). Identified soldiers include 1st Lt. Horace Seymore Bradley of the 135th U.S. Colored Infantry with an unnamed captain, Q.M. Sgt. Augustus “Gus” Blanchard of the 13th New York Cavalry with an unidentified non-commissioned officer, lieutenants Charles O. Oldfield and George W. Kline of the 96th Ohio Infantry, Capt. John Lewis Spalding and 1st Lt. Stephen Curtis Drew of the 18th Massachusetts Infantry, Maj. Edward Burgin Knox and 1st Lt. Alexander McRoberts of the 44th New York Infantry and Capt. Charles Monreau Sampson of the U.S. Quartermaster Department and an unknown man. Lieutenant Follett (1843-1907) has the distinction of being the youngest officer in command of a battery, never absent from his command a single day, though twice wounded and a Medal of Honor recipient. A sketch of his military career details his participation in various engagements, including the two in which he was wounded: New Madrid, Mo., on March 2, 1862, and Farmington, Miss., on May 9, 1862. Two images of Follett illustrate the text, a wartime carte de visite and a circa 1900 portrait of him in uniform wearing the Medal of Honor that he was awarded in 1890 for the Battle of New Madrid. Drummer Albert F. Alden (1847-1926) of the 24th Massachusetts Infantry wasn’t remembered for his battlefield heroics, though he served with his regiment four five years, but was praised after the war for his “unstinting love of country.” A wartime carte de visite from the author’s is included. In “A Never-Ending Story?” McAfee reflects on decades of writing this column. “Those readers who have persevered through thirty years of this author’s articles concerning uniforms and history certainly must realize the basic truth of that statement made at the start of our great national fratricide. From ‘continentals’ in blue and buff takes on the uniforms of the American Revolution, to Zouaves of every possible style and as many national garbs as there were immigrants in the United States; the wide variety of dress flaunted by the American soldiers of the 1800s was truly spectacular.” Six images from the author’s collection are included. Identified men include Albert G. Esterbrook (Easterbrook) of the 34th New York Infantry, J.C. Julius “Jenny” Langbein of the 9th New York Infantry (a recipient of the Medal of Honor for assisting a wounded officer from the field during the action at South Mills, N.C.), Samuel G. Devine of the 15th Pennsylvania Cavalry and Henry A. Slack of the 169th New York Infantry. A sixth-plate ambrotype from the Cecil Jackson collection is a portrait of a soldier believed to be a member of the 1st South Carolina Infantry (Orr’s Rifles). 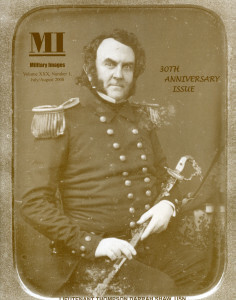 A profile of Shaw (1801-1874) details his many career from his beginnings as a midshipman in 1820 to his activities during the Mexican and Civil Wars and retirement in 1867. A detail and description of his bejeweled sword is included. Benjamin King Jr., the son of a senior medical officer in the U.S. army, resigned his commission as a West Point cadet on March 11, 1861. Young King headed to the South and became a Confederate officer. His tenure in gray was short-lived. On April 6, during the Battle of Shiloh, he was killed in action while serving on the staff of Brig. Gen. Daniel Ruggles. The carte de visite of King from the David Neville collection pictures him in his cadet uniform. A carte de visite from Gage’s Portrait Gallery in Johnsbury, Vt., pictures an elderly man in his original 1820s era militia uniform. The image is part of the Michael J. McAfee collection. An unidentified Confederate officer stands at attention with his sword drawn in this half-plate melainotype from the collection of David W. Vaughan.